Unstructured Data Analytics: Mine social media, surveys and reviews to extract granular and actionable insights for an innovative B2C marketplace. Unstructured Data Analytics: Extract real time price movements of 1000+ SKUs for key competitors. 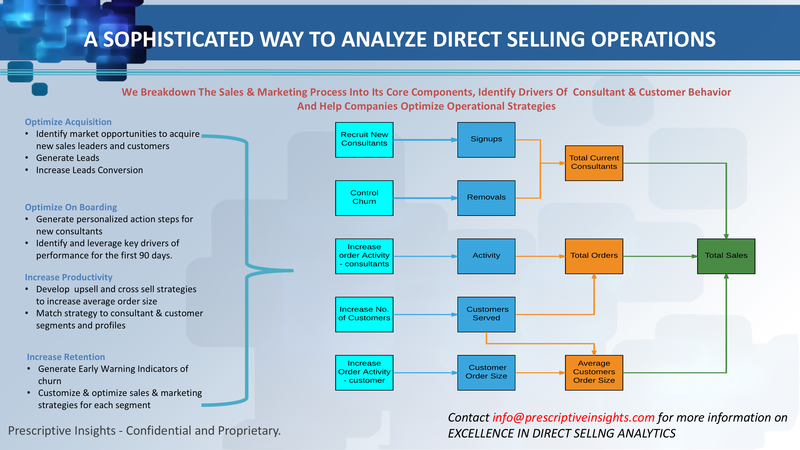 Unstructured Data Analytics: Enhance strategic and tactical decision making for an online e-commerce company. Unstructured Data Analytics: Identify customer pain points by synthesizing all incoming & outgoing customer service communications. 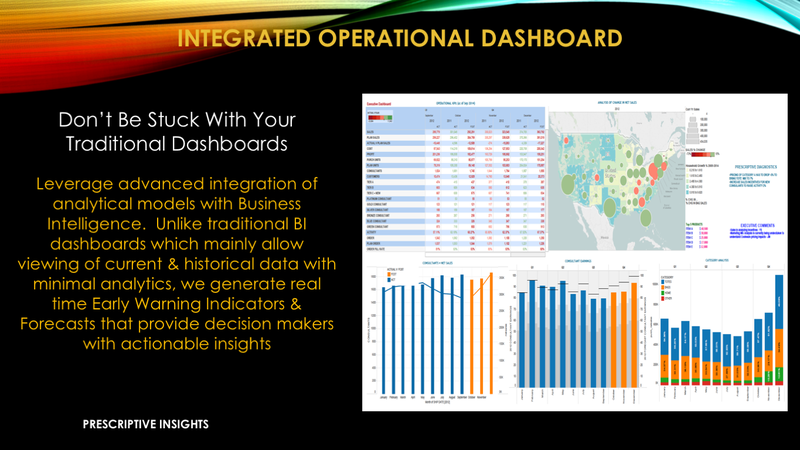 Unstructured Data Analytics: Execute deep dive into drivers of customer experience. Synthesize 100K open ended surveys into major, intermediate and granular themes. Unstructured Data Analytics: Mined 100K open ended surveys and identified drivers of customer satisfaction. Identified overlapping themes. Path to purchase for consumers has changed significantly. The old view followed a sequential process of Awareness, Consideration, Purchase, Retention, Advocacy and Growth. In the current age of multi channel and multi device shopping, the path to purchase has become more complex. 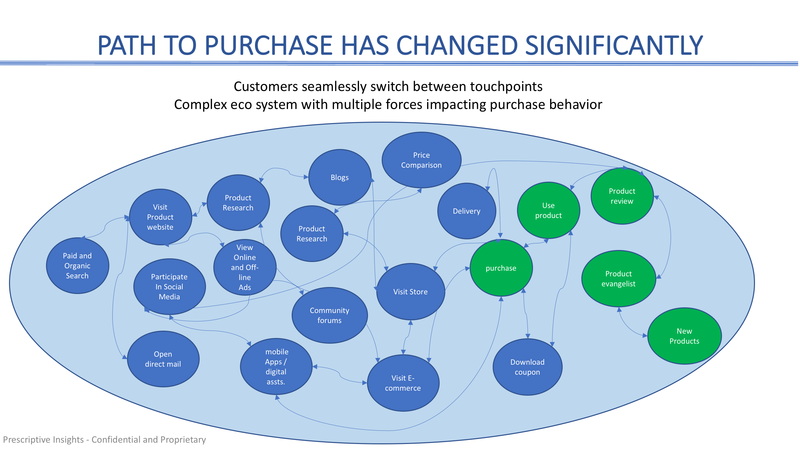 As such attribution analysis needs to focus on the impact and ROI of each touchpoint.Triggers need to be analyzed that force customers to move from one touchpoint to another. 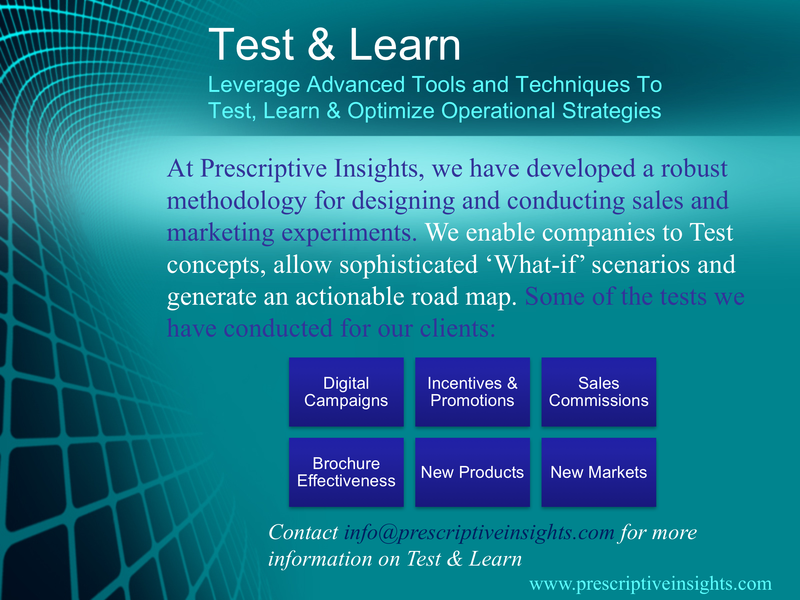 Prescriptive Insights has successfully created a model to capture the impact of these touch points. 1. Identify all Social Network Connections (Twitter, Facebook, Google+, You Tube etc.). 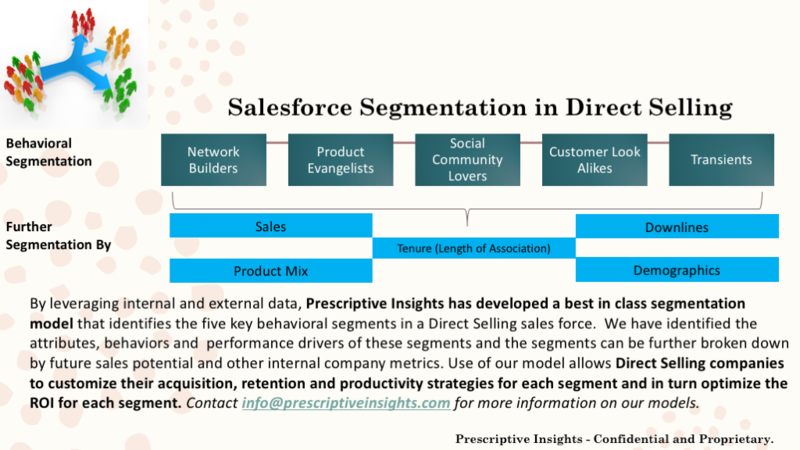 Data mine social media conversations and dialogue and identify customer and consultant sentiments across key attributes – Brand, Products, Price, Direct Selling Opportunities etc. 2. 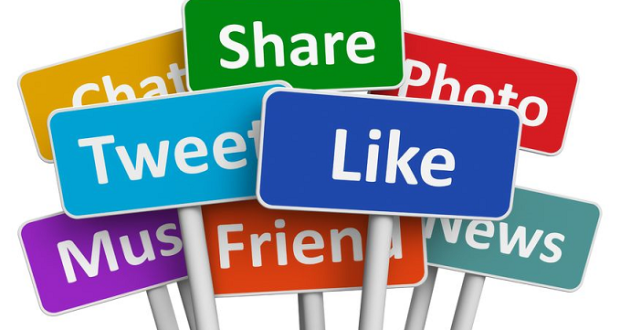 Translate customer and consultant sentiment into social and operational strategies. 3. Develop and implement real time and near real time messaging – sales and marketing responses to customer experiences. 5. Develop vibrant online communities – facilitate sharing of best practices and brand experiences. 6. 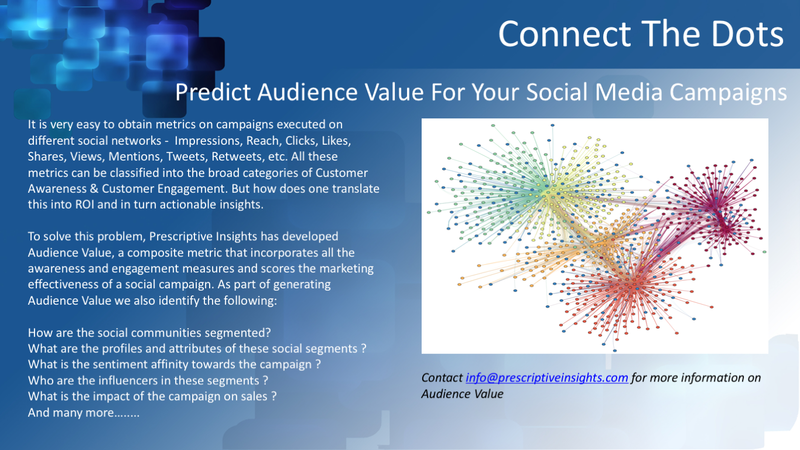 Identify primary influencers in social space. Develop marketing and sales strategies targeting the influencers. 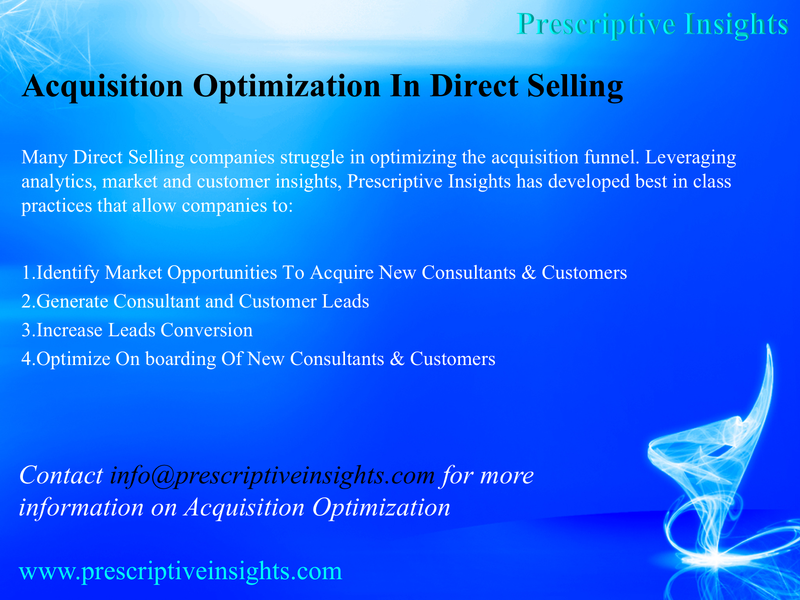 Optimizing growth and profits in today’s complex and highly competitive environment is an extremely challenging task. Companies struggle to find the right answers to business problems because they are frequently asking the wrong questions. Intuition based on business experience is still the driving factor in decision-making, leading to wrong solutions being developed for the wrong problems. 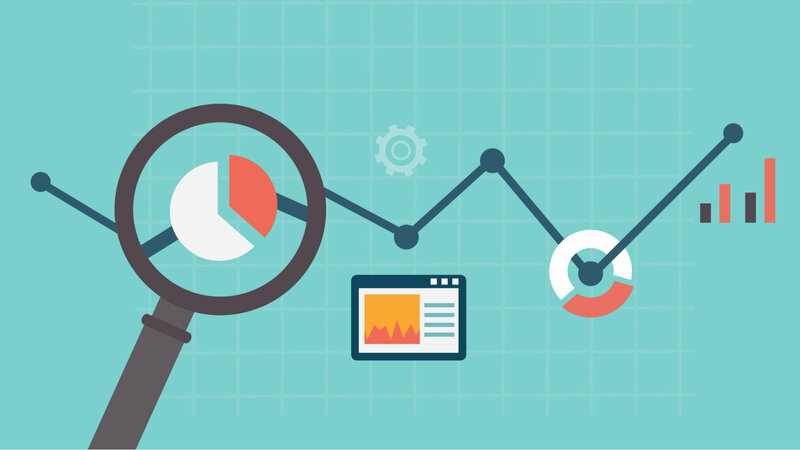 In the age of big data, demanding customer expectations and increasingly aggressive competitors, companies should move from traditional and simplistic analytics and reporting solutions that provide a snapshot of the past (hindsight) to solutions that provide an accurate picture of the present and a prediction of future trends (foresight). As a result, predictive analytics is one of the most powerful approaches companies can use to compete and win in the marketplace. The process involves understanding what happened, what is happening, why it is happening, what will happen next and, ultimately, how do we solve it? Success in a competitive world will depend on a company’s ability to amass, assimilate and act on torrents of data (both structured and unstructured). Management needs insights and predictive and prescriptive analytics, built on a platform that is agile, adaptable and fast.